Worldwide Google Search volume was up 47% for the phrase "colorado marijuana" the week leading up to 420 this year. Just thought that was kind of interesting. As a Colorado SEO Expert noted in an interview last week, "this is a significant increase in worldwide search volume for a regional phrase like 'colorado marijuana'. 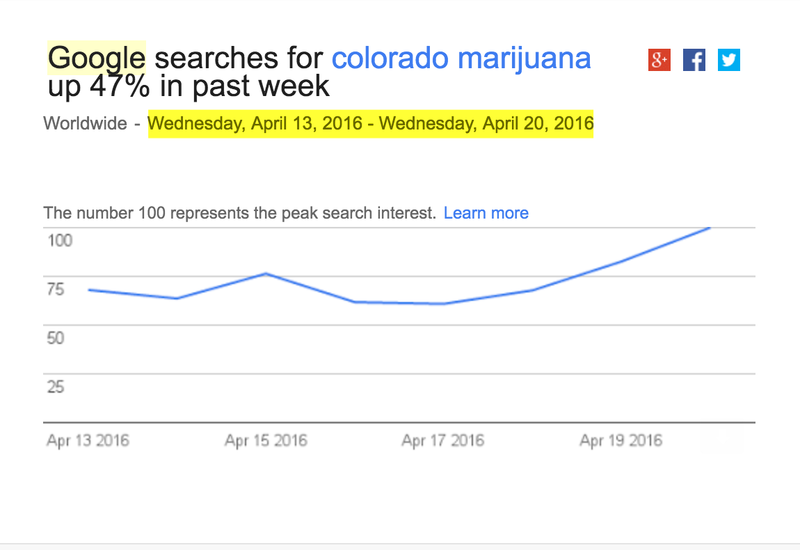 We can say with near certainty" Mr. Chierotti continued, "that the spike in Google searches for 'colorado marijuana' is a direct result of the approaching marijuana holiday that takes place on April 20th and is known as 420". Even before Amendment 64, Colorado's 420 gatherings, most notably those that were held at the University of Colorado at Boulder, were known around the world by marijuana users and enthusiasts.